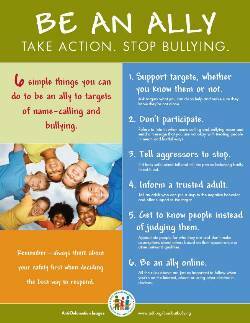 This two-sidedposter was created as a companion piece for elementary and middle school level programs that address bullying Becoming an Ally, Step Up! & CyberALLY. One side is a colorful classroom poster that helps to foster an ally culture by providing specific strategies for being an ally. The other side features Ally Action, a classroom activity with several suggested approaches for engaging students with the poster content and a full-text, handout sized version of the Be An Ally poster content. Dimensions (Folded) 8" x 11", (Full) 17" x 22"